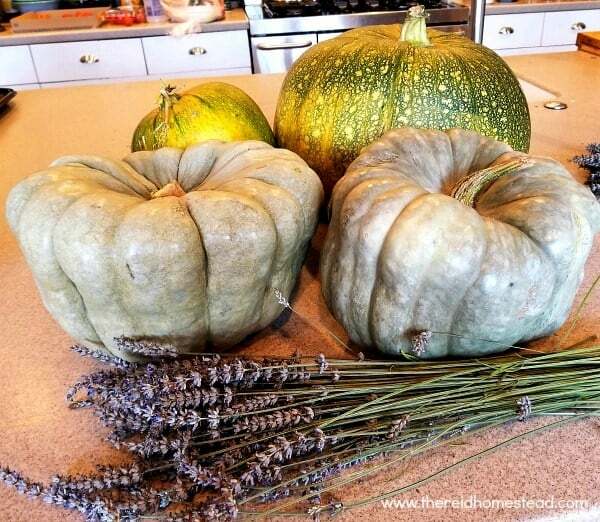 Today I am going to share with you why I think everyone should grow Blue Jarrahdale Pumpkins! 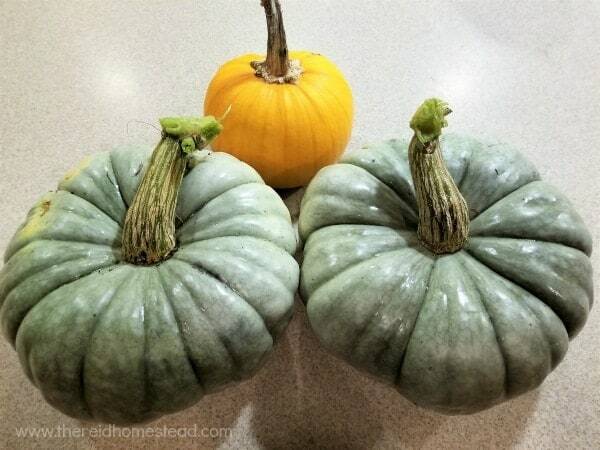 One of my most favorite foods to grow, are the beautiful blue Jarrahdale Pumpkins. Everyone who has a vegetable garden should grow them! If you don’t, you will see them at your neighbors house and wish you had some of your own! Really! 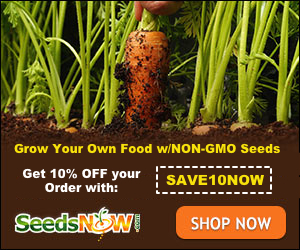 It is almost seed buying time, so definitely put these on your list! 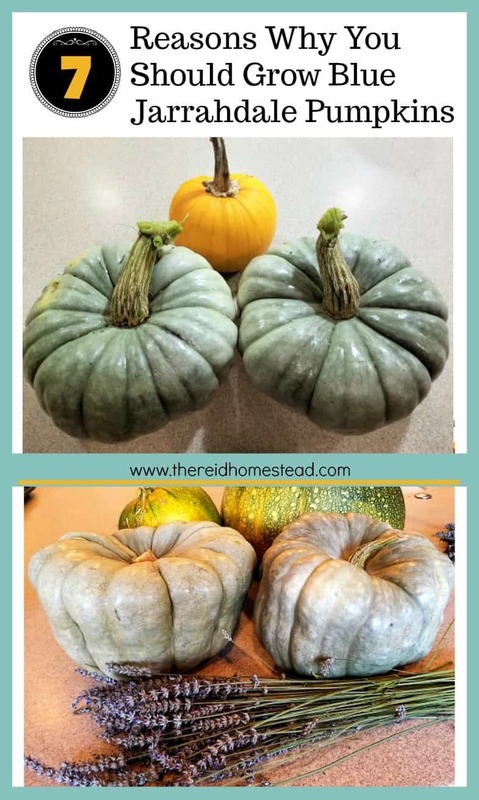 OK, here we go, these are the reasons why you need to grow blue Jarrahdale Pumpkins! And be sure to scroll to the bottom of this post for a great list of other fun pumpkins to grow! Such a lovely contrast up next to a regular old pie pumpkin! 1 1. They are BEAUTIFUL!!!!!!! 2 2. They are a great investment! 3 3. They can make you some money! 4 4. They taste delicious! 5 5. They have an amazing texture! 6 6. Pumpkins are super healthy! 7 7. They are super easy to grow!!! 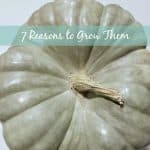 8 Other Cool Pumpkins to Grow! Just look at them! They are a gorgeous blue-green-greyish color. They contrast beautifully with the traditional orange, or also look great with white pumpkins, for a more modern farmhouse design! Stack them in alternating colors on your front porch, and you will be the envy of your neighborhood! 2. They are a great investment! If you are trying to get a lot of bang for your buck in the food department, you need to grow these. If cured correctly, (let sit in the sun for 7-10 days after harvesting, which allows the skin to harden) they can last up to 12 months in a cool dark place in your home like a closet or unheated room, even under a bed. On average, mine have weighed about 15 lbs each, some get much larger than that even! That is easy peasy long lasting, whole, real, healthy food that is inexpensive, so they are great for the budget. Especially if you grow them yourself! 3. They can make you some money! If you sell at a farmer’s market or have a farm stand at the end of your driveway, you can bet these will be top sellers. Most people haven’t seen them before, because they are not your average run of the mill pumpkin. Grow some for you, and grow some to sell! Or just share with your friends and family. Pumpkins and lavender! Two of my favorites! These are my absolute favorite pumpkin or winter squash for eating. It used to be Butternut Squash, but I think these are even better and are often much larger than an average Butternut, so more bang for your buck. See my this article that shows you how to roast them, and freeze the fruit in baggies for easy use in cooking. Instead of grabbing for that can of pumpkin that most folks buy at the grocery store, grow it yourself! By putting some in the freezer that has already been cooked, it than becomes easy to use in everything from pumpkin curry to pumpkin pie and everything in between! 5. They have an amazing texture! These are not stringy at all, like many pumpkins. They are also super dense, and not watery. Almost creamy. Perfect in my opinion. Almost like lump-free mashed potatoes. Look at that gorgeous orange pumpkin meat! So full of nutrients! Add more of it to your life! 6. Pumpkins are super healthy! Everyone should eat more of them. Used them in smoothies, or cut them up in chunks and roast them and serve as a side for dinner. Or, roast them, and use the leftovers to top your salad for lunch the next day. One of my favorite ways to use them is in this Pumpkin Spice Steel Cut Oats recipe for breakfast! Think outside the box! They are super high in beta-carotene, fiber, vitamin A & C and potassium. 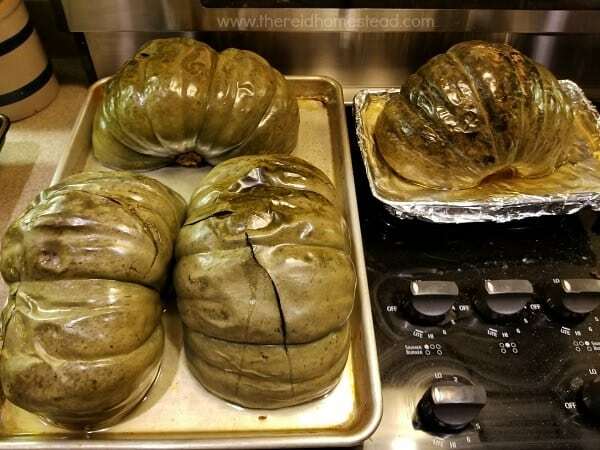 Roasted Jarrahdale pumpkins, straight out of the oven! A wonderful super food, a whole food, a REAL food! 7. They are super easy to grow!!! Winter squash and pumpkins are one of the things I always recommend people grow when they are just starting out with vegetable gardening. All they really need is some space, a sunny location, and some good fertile well draining soil. 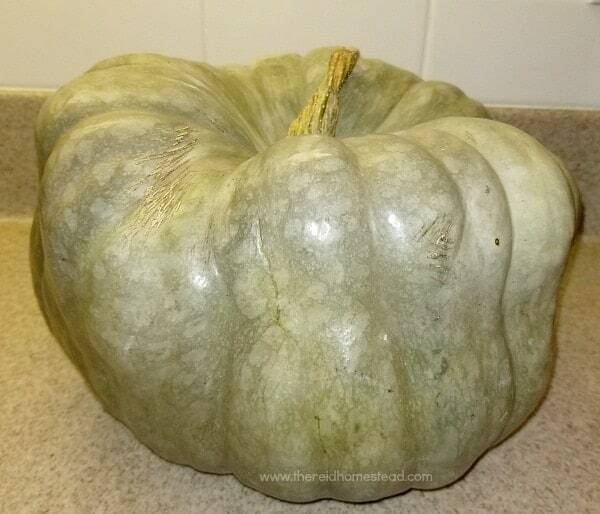 A gorgeous blue Jarrahdale pumpkin. 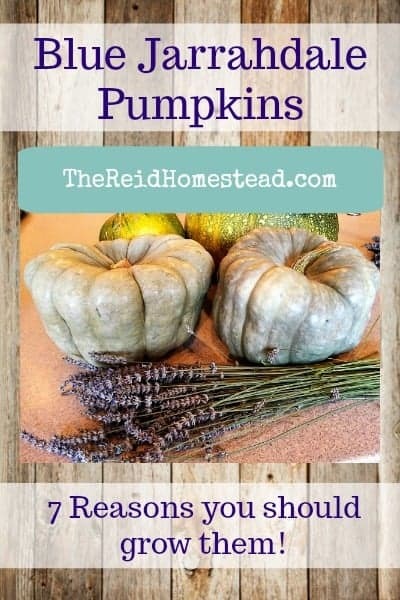 Other Cool Pumpkins to Grow! 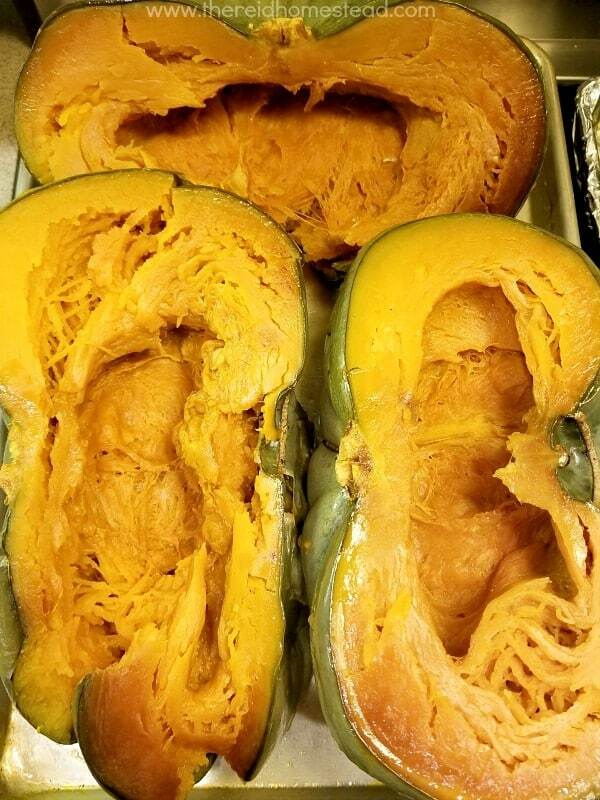 Well, now you know why you should grow blue Jarrahdale Pumpkins. But there are lots of cool pumpkins to grow. This weekend I was looking at seeds and growing my order list, and found these fun ones too! 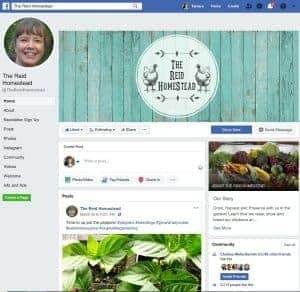 So go put them on your seed list, and share the seed with your friends and family Or don’t share the seed, and amaze them all at harvest time next year! 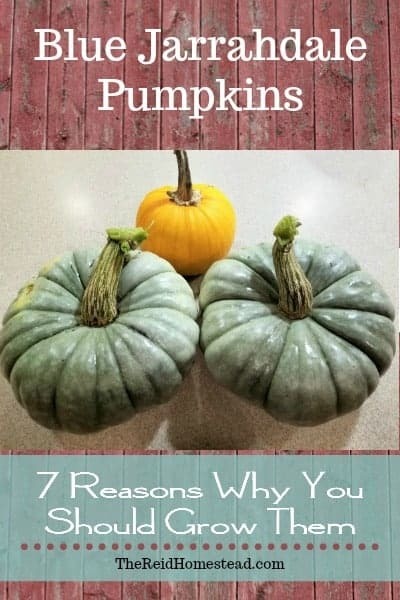 Save “7 Reasons Why You should Grow Blue Jarrahdale Pumpkins” to your Favorite Gardening Pinterest Board! Definitely adding to my list of seeds to buy! They are so beautiful! You will love them Nancy! These are striking in their color but I love you explained the texture as well. Looks like a great addition to the garden! 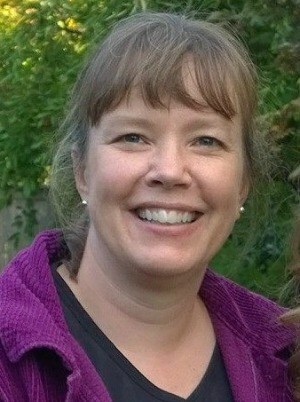 Hi Jennifer, I am excited because this year I found white pumpkins and peach pumpkins that have a similar shape. I think the three colors put together when decorating the front porch will look pretty cool! These pumpkins did really well for me over trellis with support, even after I was losing other pumpkin plants to mildew and they tolerated my dry summers too. I was pleasantly surprised with the taste, the Marina de Chioggia pumpkins are my favorite for taste but these were close! Hi Emma! I have some Marina de Chioggia to try this year, I am excited about them! Glad these did so well for you when others did not! Thanks for visiting!